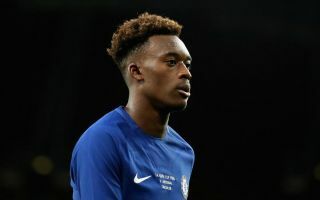 It’s rare that a player attracts so much attention after so relatively few Premier League minutes, but that’s where we are with Chelsea wonderkid Callum Hudson-Odoi. The immensely-gifted 18-year-old has just made his England debut after impressing whenever he’s got into Chelsea’s first-team this season, and even before he’d made the bulk of his appearances for the Blues he’d been a top January transfer window target for none other than Bayern Munich. Remarkably, Hudson-Odoi was targeted not once, but four times by Bayern in the winter, according to Sky Sports, with the player keen to leave Stamford Bridge at that time. If he’s not playing much at Chelsea, would he really get much more in the way of minutes at a club like Bayern Munich? The Mail claim CHO will be a target for the Bavarian giants again this summer, and there may well be an opening as ageing duo Arjen Robben and Frank Ribery head towards the end of their Allianz Arena careers. But even after that there’s Kingsley Coman, Serge Gnabry, Thomas Muller and maybe James Rodriguez if he makes his loan move permanent – some truly huge names to compete with. While it’s tempting to look at the likes of Jadon Sancho and Reiss Nelson getting game time and developing well in Germany, we’re not convinced Bayern actually represents the same opportunity. As noted in the link above from the Mail, Liverpool are also among the suitors for Hudson-Odoi, and may be a better move for the youngster. Jurgen Klopp could do with more options alongside his front three of Sadio Mane, Mohamed Salah and Roberto Firmino – with the latter of those two seeing a significant dip in form this season. Xherdan Shaqiri has not been that much in the way of a backup, meaning there could be room for Hudson-Odoi to become the latest young talent to shine under Klopp, who seems ready to throw youth players in when required. Also named as admirers in that link from the Mail are Manchester United, who do seem to be in the hunt for an attacking player of Hudson-Odoi’s style this summer. The Daily Mirror have notably linked the Red Devils with Dortmund ace Sancho, but why splash the cash on a settled player with a long-term contract when you could get a similarly exciting talent for probably a bit cheaper due to his contract being up at the end of next season – and weaken a rival in the process? For the player himself, however, a move to Old Trafford should perhaps be approached with caution due to their recent tendency to chop and change managers, even if things look promising at the moment as Ole Gunnar Solskjaer brings in more attacking football and promotes youngsters of his own. As also noted in that Mirror piece, Sancho moving to United could see Dortmund move for Hudson-Odoi to replace his fellow England starlet. Given how well things have gone for Sancho with BVB, this might be the best possible next move for the Blues misfit to get the playing time he wants from a club he knows will value his development. With Christian Pulisic also set to leave Dortmund for Chelsea in the same summer, there’s a chance for Hudson-Odoi to make the west Londoners look very silly indeed by going and doing a better job than the player they’ve just signed for the very club they signed him from.